First, Happy Birthday to Alexa who is a Guitar Hero master personified and design guru over at Strutta. She’s celebrating with some of the usual suspects so I fully expect documentation of the fun times and debauchery to show up on Jaiku or Flickr tomorrow morning. Second, tomorrow is Dingo’s birthday. She’s such a kind person with so much wisdom and spirit. 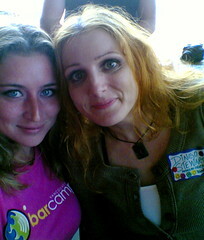 I’m really glad to have been able to get to know her at unconferences and through the blogosphere in the last few years. Last but not least, John Goldsmith (aka waxypoetic on Flickr) is celebrating opening night of a photography exhibit in Chinatown. STRANGER: A photography exhibit of strangers and unfamiliar landscapes. The work is a diverse mix of the abstract, the dreamlike, and the street. John’s works are pretty amazing and capture a candid side of Vancouver few others can pull off. You can preview the show here, swing by tonight, or anytime before April 26th.